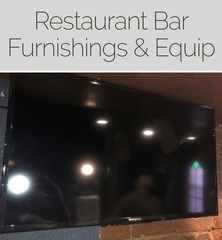 M21896 Select Restaurant and bar equipment furnishings and fixtures of this Washington DC establishment, client supervised. AUCTION CLOSING DATE: Friday, November 2nd 1:07pm. Bidding closes on the first item at 1:07pm, then closes at the rate discussed in these Terms and Conditions of Sale.